involving unmet obligations, may be valuable. Responsibility is important because it cannot be escaped. Therefore, we can choose to embrace our obligations, and turn them into something positive, or we can fight them. If we fight them, we loose, we complain, we feel bad, and we are generally pessimistic and unhappy. I choose the first option. Life is so much more fun when we have an appreciation for it, and a sense of accomplishment from it. Don't you agree? If we accept that responsibility is simply a part of life, and can be good, how do we teach this virtue to our children? I believe modeling this behavior and providing clear expectations of desired behavior are powerful tools. Home - provide chore charts to help children keep track of household chores and duties. Create a homework/school area where children may complete school work. Provide opportunities for children to take care of, feed, play with, and walk pets. School - create classroom jobs. Rotate jobs on a regular basis. As a class, create a list of student responsibilities. As a teacher, provide clear expectations, structure and routine. Environment - throw away trash at parks, schools, or other places within the community. Use a responsible amount of water when gardening/watering the lawn. Walk to school, instead of driving a car. Plant a tree. Oneself - practice good self-care habits. Brush teeth, bathe, eat healthy food, drink water, clean up after oneself, wash/dry clothes, be accountable for one's actions. Follow through on commitments, and be trustworthy. 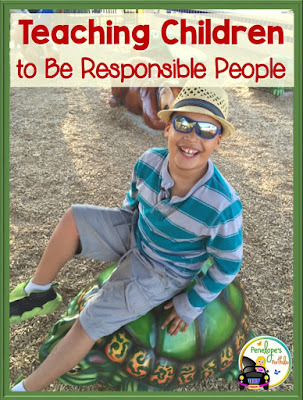 Ask children what other areas responsibility may be seen. 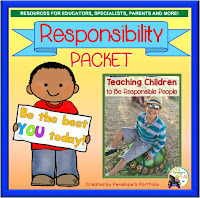 To supplement this, I have created a Responsibility Packet that may be used by teachers, parents, school counselors, social workers, speech therapists, special education teachers, and other specialists. Included in this packet are activities, printables, posters, awards and more. Click on my Responsibility Packet to see full product details. In your opinion, what is the most important responsibility to teach children? Hi! I’m Jennifer! I'm a mom to three cute kids, with a background in Education and Psychology. I’m all about kids, character education, and social skills! Click on my picture to read more about me. Join my newsletter to get tips, news, and special offers delivered right to your inbox! Don't forget to confirm your email to activate your subscription. Crucial Chore Charts That Will Motivate Any Kid! © Jennifer Jones @ Penelope’s Portfolio 2017. Simple theme. Powered by Blogger.